All metal construction with Nylon inserted Anti Viking Perbunan Diaphragm for Gas, Buna Nit rile for Air No Gland Packing. Non protruding type adjustments Spindle with thrust bearing fitted for ease of spring adjustments. Protective cap and locking arrangement which disables unauthorized tampering with the set pressure. Also available with External impulse line with vibration damping valve for greater accuracy in outlet pressure. Constant set pressure, (+/-5% of the set range ), irrespective of change in inlet pressure and flow. Solid steel construction designed to API Standard. OPERATING PRINCIPLE :The regulation takes place by means of a spring force by moving the diaphragm and the stem against the gas pressure flowing through the regulator, below the diaphragm assembly.The outlet pressure can be varied by means of adjusting the spring force. 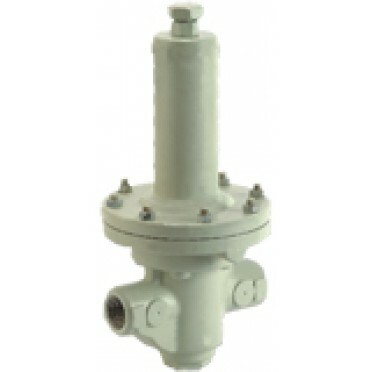 The design offers constant set pressure(±5% of the set point)irrespective of change in inlet pressure and inlet flow. Also available with external impulse line with vibration damping valve to achieve greater accuracy in outlet pressure.